The Seminoles are 44-10 since Jimbo Fisher took over as head coach in 2010, but Florida State has lost just twice during the past two seasons. 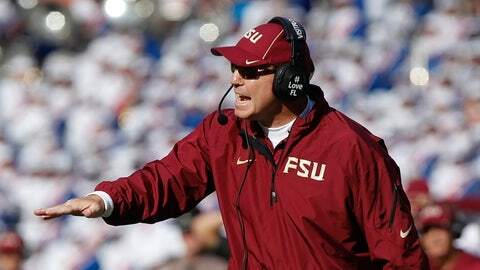 TALLAHASSEE, Fla. — There were plenty of times in the 2010 season when Jimbo Fisher’s frustration was visible, the steam building inside over the struggles of reshaping Florida State’s football program. In November 2010, Florida State’s promising 6-1 start began to turn very ugly. There were back-to-back losses, first at North Carolina State on a goal-line fumble in the final minute and then after failed defensive efforts and missed field goals at home against North Carolina. Florida State was 6-3 and slipping back to its late 2000s form. Fisher then let loose a geyser of emotions at his Monday press conference following the loss to the Tar Heels. "This team has to learn to develop a killer instinct," Fisher said in a raised voice during a lengthy rant. "And not hope to win but understand how to win. There’s nobody on this football team that has. There’s nobody on this football team that has reached that level and understands what it takes." Fisher was essentially calling out his players. He was challenging them to prepare and practice harder, to play smarter. The wins and losses from 2010 reminded that the rebuilding job wouldn’t be achieved in a season. Fisher knew that it would take time (a process) and that it would take the right mind-set by the players (a culture). Fast forward three years, and Fisher has Florida State at No. 1 and 13-0. He’s built more than a team, it’s what he thinks is a program that will hold up for the long haul. "What I love about what we’re doing right now, we’re becoming a program," Fisher said. "I’ve always said that teams come and go. Programs sustain the test of time." The past few seasons, it was clear that Fisher and his staff were on the right track. And it was evident that the players were responding to the challenge. Fisher and his staff recruited better, but it was more than just winning the services of five-stars and four-stars. It was finding the right athlete who was willing to not just bring his talent to Tallahassee but would be coachable and would be self-motivated. And it wasn’t about making himself better, but also those in his position group and then the team. The results began to show the progress but every season there was a stumble or two. Even in 2012, a season that saw an ACC title and an Orange Bowl win, ended 12-2. There was celebration but also disappointment, too. It was a not-so-subtle reminder that FSU was improving year-to-year but not yet achieving what it should as a program. That’s why fans took the 2012 losses so hard. Florida State was supposed to have learned plenty from the losses. This was a veteran team with a senior quarterback, playmakers and pass rushers. But those losses at N.C. State and against Florida were a reminder of what happens when you let your guard down and don’t prepare well. Remove 11 players that were drafted, including a pair of first-rounders in quarterback EJ Manuel and cornerback Xavier Rhodes. Remove seven starters on defense. Take away six assistant coaches. Through all those losses, Florida State made progress in 2013 and is 13-0. A season in which there have been 13 wins and all but one of them a completely dominating performance. "We had 11 guys drafted last year, 14 guys signed pro contracts," Fisher said. "We’re able to come back with the senior leadership and some young guys that incorporate the program and our assistant coaches. And that’s what we want. We want to be a program, not a team." These Seminoles had to lose at first to understand how much more they needed to push each other and themselves to win. The players are having fun out on the field, of course, but what drives them more often than not is that they hate to lose. The losses of 2012 shaped the winning of 2013. "We did envision this after last season because we left a lot out there on the table," linebacker Telvin Smith said. "We felt it was so much that we were supposed to accomplish." What Florida State has accomplished is building a program that aspires to do something special. Part of it is the chase for the national title. But the other aspect is restoring the program to where it once stood. Back to being a program that’s one of the best in the nation.